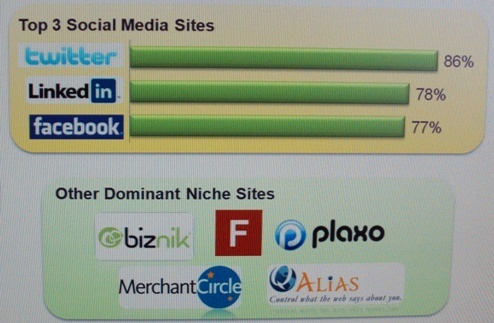 According to “Social Media Magic“, here are the top social media sites for professionals and business. LinkedIn would be expected. Twitter and Facebook for professionals is at first surprising. However this company sees value in these in searching for common interests, such as how other peoples needs might fit your services. The “Other Dominant Niche Sites” are geared more for business, but can get you on the front page of any Google search, so these come recommended. The advice was to establish accounts on all of them. I haven’t explored this yet myself, so will have to let you know. In the mean time perhaps some of you can let me know….